A badly injured dog, named Caesar, has now found himself a new forever home. Caesar, a one-year-old Chihuahua, was in severe pain when he was brought into Mayhew by our Animal Welfare Officers. Caesar was suffering from an unhealed broken leg and could barely walk. 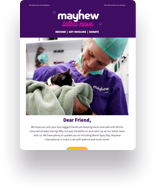 The previous owner signed the dog over to Mayhew, as they were no longer able to care for him. Caesar was quickly seen to by our experienced Vet team at our on-site Community Vet Clinic, where he received pain relief and antibiotics. Unfortunately, the previous surgery that Caesar had received on his leg had never healed and the muscle was unable to recover. The injury was so complex that our Vet team made the hard decision to amputate his leg. Fortunately, Caesar recovered well after the operation. The dog, who had previously been limping in pain, quickly adapted well to walking on three legs. As soon as Caesar had adjusted to life on three legs, he was put up for adoption and found a home almost immediately. Caesar, now renamed Pippa, is currently enjoying his new pampered lifestyle with his devoted family. Our Animal Welfare Officers rescue hundreds of abandoned, neglected and abused animals every year, respond to animal welfare issues out in the community and provide ongoing support to carers and pet owners in vulnerable situations. Find out more about their work here and please consider a donation to help them help even more animals like Caesar. If you or anyone you know needs to speak to a Mayhew Animal Welfare Officer, then you can call us on 020 8962 8000.